Once you’ve experienced the time-saving efficiency of a good dishwasher it’s hard to go back to hand washing, but the convenience of a dishwasher can all too often be offset by poor results, and loud and long cycles. If you want to enjoy spotless, gleaming crockery that’s dealt with in super-fast time, then take a look at our range of Kenwood dishwashers. The new generation of Kenwood dishwashers uses the latest dishwasher technology to tackle a variety of different loads with effortless speed and spotless results. Models like the Kenwood KID60B16 feature quick washes that are complete in just 30 minutes. 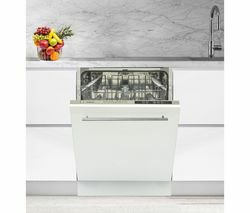 Considering its huge 14 place-setting capacity, that means this brilliantly efficient dishwasher can dispatch a banquet’s worth of washing up in no time at all, leaving you to enjoy the rest of your evening. Our Kenwood dishwasher range accommodates all kitchens, from slimline models which can fit in the tiniest studio apartments to full-size models that’ll effortlessly match the demands of large family kitchens. Whichever size suits your setup, you can expect whisper-quiet sub 5-decibel noise levels and energy bill shrinking efficiency from your Kenwood dishwasher. 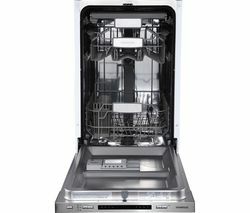 Check out our complete collection to browse integrated and semi-integrated dishwashers from leading brands. Our extensive range offers the latest Smeg, Beko, Bosch and Grundig dishwashers.